On a recent Saturday, I visited three active nests of American Bald Eagles in South Florida to observe the eaglets and the pair of parents and to photograph some of the activity. The nest in Marco Island held the youngest eaglets, with two in the nest who were still weeks away from their first flight. As the eaglets moved around and stood up on the edge of the nest to take care of business — you know, to keep the nest clean — we got a good look. Marco Island bald eaglet stands on edge of the sturdy nest and peers overboard. March 23, 2019. Using my Tamron 150-600mm lens on my Nikon D800 mounted on a Really Right Stuff tripod, I got these close up photos, using ISO 200 around 10 am. It will take five years for these brown eaglets to look like their parents with white feathers on the head and tail. Scanning to the right and left, this bald eagle parent is on guard, to protect the eaglets in the nest. Perhaps a dozen spectators with a variety of cameras, long lenses, tripods, binoculars and camera phones gathered on the sidewalk at a respectful distance (behind a rope as a reminder). One told the story of last year’s drama: The father eagle was electrocuted in a power line while chasing off prey. Some time later, a new male eagle arrived on the scene, and finding eaglets in the nest, he threw them out. The young eaglets, unable to fly, plunged to their deaths. This year, the family is doing well. 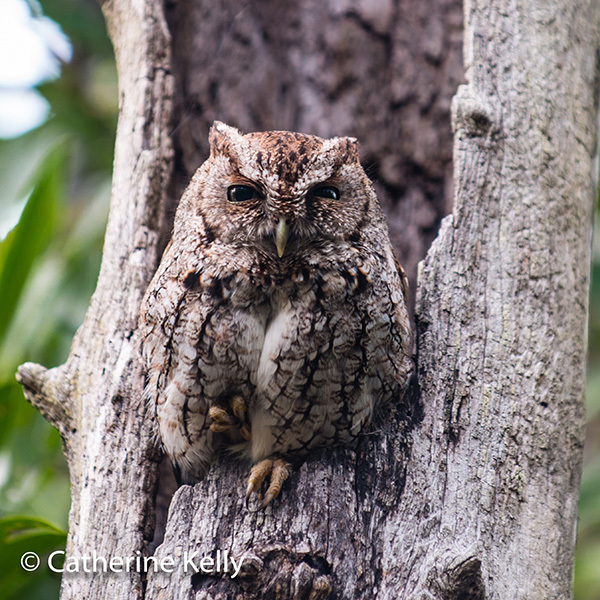 This little screech owl didn’t utter a peep (or a screech) while I set up my tripod to photograph him. He just went to sleep. Luckily, I got a shot of him with his eyes open before he drifted off to dreamland. Other people who stopped to admire him, sitting in the hollow of a dead tree suggested that the owl must be female, as it was sitting on a nest. I did some reading and learned that the males tend to establish a nest in the late winter (now) — in the hollow of a tree — a rich environment for prey of insects, reptiles and small mammals. The female owls then “marry for money,” choosing the mate based on the quality of the cavity and the food supply. Who knew? Evening light was low, and I used my 200mm Nikon lens on my Nikon D800 camera body. I used a wide 3.5 f/stop in order to blur the background and put visual emphasis on the owl. For low noise and a crisp image even after cropping, I used ISO 200, and my shutter speed was 1/13 second, making a tripod essential. Screech owls have acute hearing, but this one was extremely tolerant of people walking by, and the occasional loud quote, “Oh, I SEE IT!” His coloring and texture makes him well camouflaged. He ignored all of us, and saved his trill for the hunt, when he uses it to scare off another raptor that might also want to catch the same mouse. 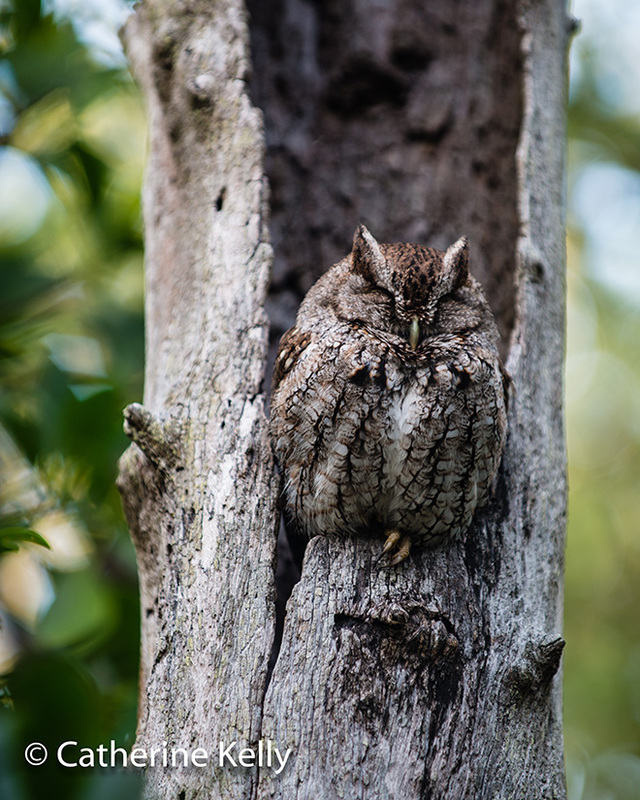 Good night, Little Screech Owl. You are safe. It is always a privilege to observe wildlife in its habitat and to photograph it without disturbing it. I’m so grateful that he knew we came in peace to admire him. Take a look at those claws! Sunset is the main event. At 6:12pm, scores of us have a drink in hand, a friend nearby and a sense of anticipation. The big orange ball is dropping fast. Will there be a green flash? But zoom your lens back to a wide angle of 24mm, focus on the sky, and you will notice the unique designs the clouds are making. Did anyone else notice? 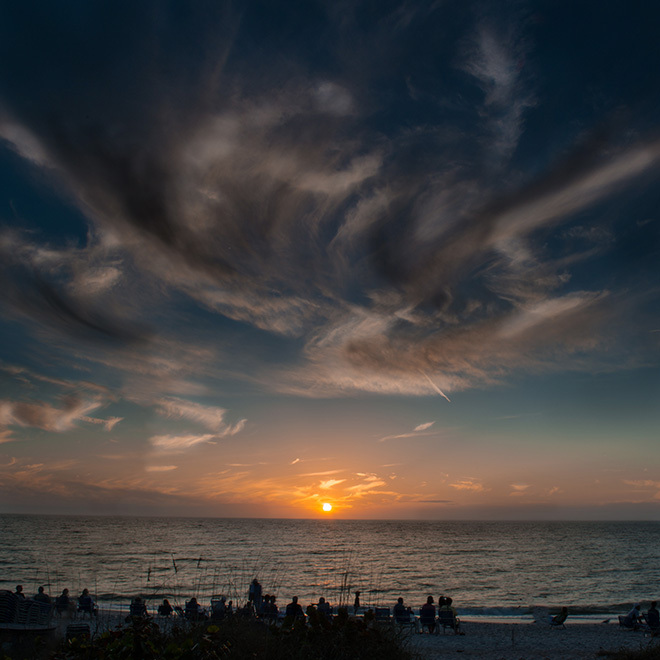 Looking through the lens with two Singh Ray filters holding back the exposure on the sky, you can see a painterly view of the evening sky over the Gulf of Mexico on February 3, a scene worth remembering. While sunset gets all the credit, let’s not forget to applaud the clouds, best supporting actors. Now, I pass on the challenge to you! (Hint: this is way easier than the ice bucket challenge!) All you have to do is make time at dusk and go outside with your camera. I’ll share a few tips that guided my shooting and processing of my house photo. 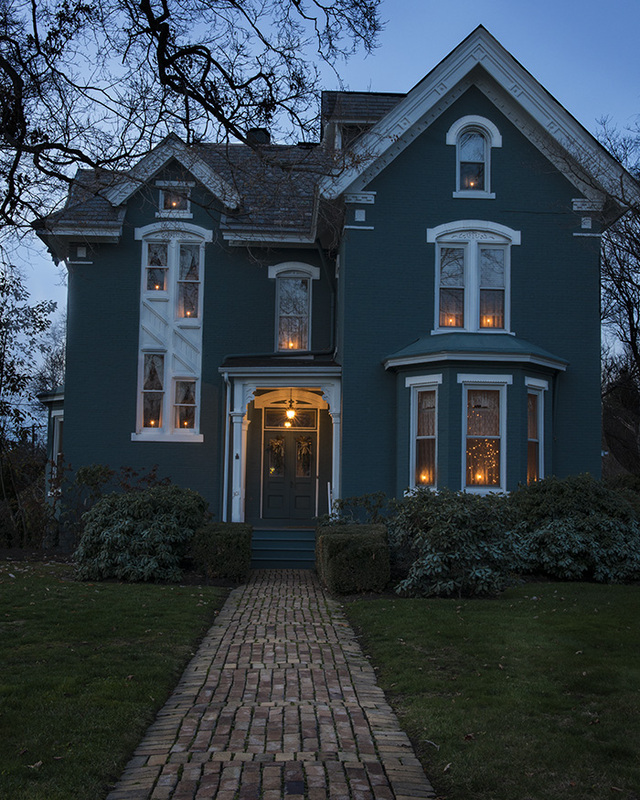 My family takes an understated approach to Christmas lights by putting simple candles in the windows of our Victorian house. For my photo, I attached my Nikon D800 to a Really Right Stuff Tripod. (Any tripod will do as long it is sturdy enough for your camera. The best camera for the job is one you can set manually.) I had an overcast evening, but snow would make the scene even nicer. With the D800, ISO 400 is pretty noise free, and I set the lens for f/16, hoping for a little star effect on the lights. I began on Aperture preferred mode for one frame, and then changed the mode to manual and bracketed the exposure higher and lower, so that I could choose later the best exposure for the house, the sky and the lights. The sun was setting in front of me on the left, which was not ideal, but didn’t cause a major issue. When I imported the exposures into Lightroom, I chose the one-second exposure. It really wasn’t necessary to tone-map multiple exposures in Photomatix or Photoshop, because I only needed to bring the exposure of the house up a little, and the sky down a little. In Lightroom, I adjusted the shadows up, clarity up, white balance toward blue and lens correction vertically (to correct the look of the house leaning back). Exported into Photoshop, the image was ready for some dodging and burning to lighten the white trim on the house and darken the edges of the frame. Since the image would benefit from a strong darkening of the sky, I used the multiply blend mode on a duplicate layer and a mask to isolate the sky. One more sneaky trick you may enjoy: Three windows did not have candles in them, but I was able to clone stamp candles in them for a more complete look. Here is my final image. If you need help making a memorable photo of your home with Christmas lights, feel free to contact me. There is no place like home in any season.